Slightly more than a year ago, the world was shocked at the dramatic death tolls in Kenya and Pakistan when jihadists, in separate attacks over one weekend, killed more than 150 innocent people -- with the Kenya attack claiming victims aged between two and 78. In a public speech after the "black weekend," Turkey's then Prime Minister Recep Tayyip Erdogan (now President) looked very sad. Indeed, he was sad. But not for the victims of terror attacks the previous weekend. He was mourning Asmaa al-Beltagi, a poor, 17-year-old Egyptian girl who had been shot dead by security forces in Cairo as she was protesting the ouster of Egypt's Muslim Brotherhood president, Mohamed Morsi, in a July coup d'état. Asmaa's father was a senior Brotherhood figure and after her death, Erdogan once even shed tears during a televised speech. He then commemorated the girl at almost every election rally. Earlier in 2013, Erdogan's Egyptian comrades, the Muslim Brotherhood, had perpetrated the worst attacks against the Coptic Church of Egypt since the 14th century. In one particular week, 40 churches were looted and torched while 23 others were attacked and heavily damaged. In one town, after burning a Franciscan school, Islamists paraded three of its nuns on the streets, as if the nuns were prisoners of war. Two security guards working on a tour boat owned by Christians were burned alive; and an orphanage was burned down. Meanwhile, the Brotherhood's Facebook page claimed that, "the Church has declared war against Islam and Muslims." Today if one typed the words "Islam" and "terrorism" into a quick search, Google would produce over 42 million results. But one of Erdogan's favorite statements is his famous line, "There is no Islamic terror." In various times and capitals, Erdogan has powerfully stated that, "Muslims never resort to terror or violence." Once he said of Omar al-Bashir, Sudan's Muslim president, who is wanted by the International Criminal Court on charges of genocide and crimes against humanity: "I went to Sudan and did not see any genocide there. Muslims never resort to genocide." The world's Islamic terrorist organizations must have felt disappointed by Erdogan's perpetual denial of their existence, acts of terror and stated goals. They sent one such group to Erdogan's doorstep so that he could rethink his "denialism." The death toll in Syria and Iraq at the hands of extremists from the Islamic State of Iraq and Syria [ISIS] is estimated at "several thousand" since the summer, when the group took large swathes of land in the two countries neighboring Turkey. Only last Sunday, ISIS's jihadists lined up and shot dead at least 50 Iraqi men, women and children from the same tribe. The killings, all committed in public, raised the death toll suffered by the Sunni Al Bu Nimr tribe in recent days to 150. Earlier last week, Human Rights Watch reported that ISIS executed 600 Iraqi prison inmates when they seized Mosul, the country's second-largest city, in June. Ironically, in June the same men kidnapped 49 Turks, including Erdogan's consul general and consulate officials along with their families, in Mosul and kept them as hostages for 101 days before they agreed to release them in exchange for ISIS terrorists kept in Turkish prisons. None of these acts seems to have persuaded Erdogan that the terrorists were killing simply for the universal advancement of Salafism, and that they call themselves Muslims. After a meeting in Paris with French President François Hollande, Erdogan gave a lecture and accused "those who try to portray ISIS as an Islamic organization...." Fortunately, he did not claim that ISIS was a Jewish organization. "Mind you, I am deliberately avoiding the use of the acronym ISIS [because it contains the word 'Islamic']. I use the name 'Deash' because these are terrorists." Call it a slip of the tongue, but there is no such word or acronym as "Deash." There is, though, "Daesh" ("ad-dawlah al-Islamiyah fil- Iraq wa ash-Sham"). Nice try by Erdogan, but not quite smart enough. The Arabic acronym "Daesh" also contains the word Islamic ("al-Islamiyah"). Erdogan may next time try a Sanskrit, Zulu, Swahili, Malagasy or Kx'a acronym for the jihadists, but they, too, by simple logic of acronyms, should contain the word "Islamic." Erdogan's Paris lecture exhibited more interesting mental logic. The international media, he said, is engaged in systematic efforts to portray Turkey as a country that supports "Daesh." 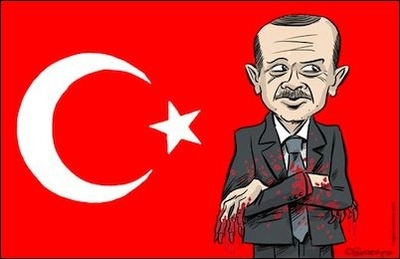 By all means, the Turkish president has every right to object to such portrayal no matter how unconvincingly. But Erdogan did not stop there. He said those media members were "virtually traitors"! And he left it to his audience to find out how foreign nationals could also be Turkish traitors. It was vintage Erdogan. There is no Islamic terror. ISIS is not an Islamic organization and its name is not even ISIS; it is "Daesh." And foreign journalists are plotting treason against Turkey.